Just how safe is kombucha tea? Kombucha tea deaths have given sippers of the popular health drink a reason to question their beverage choices. Although proponents of the tea swear by its safety and potential benefits, the tea has been linked to both serious illness and death. Ethyl alcohol, found in alcoholic beverages, is also often present in kombucha, but the level in tea (usually 0.5%) is low enough to classify the beverage as non-alcoholic. Kombucha tea has been popular in Russia and Eastern countries since the 19th century, but it didn't begin to gain traction in the United States until the 1990s. Proponents of the tea tout a number of health benefits, including improved digestion and liver function and cancer prevention properties. The tea is widely available in health food stores and even some grocery stores. It is sold as loose tea leaves, tea bags, and prepared tea. In April 1995, a woman who had been drinking kombucha tea for two months entered the hospital with severe acidosis, brought on by excessive levels of lactic acid. After two days of treatment, she entered cardiac arrest and died. Also in April 1995, another woman who had been drinking kombucha tea for the same amount of time entered the hospital with similar symptoms and a high level of lactic acid. She also experienced cardiac arrest, but doctors were able to save her. She recovered, but the two incidents led the FDA to issue its first warning about kombucha. Researchers investigating the deaths found the tea the women had been drinking originated from the same kombucha colony. Some doctors have linked other dangerous conditions to kombucha, including anthrax of the skin, jaundice associated with liver damage, and severe allergic reactions. There have been other deaths possibly associated with kombucha consumption as well, but they don't provide enough evidence to draw a direct link. Despite reports of kombucha tea deaths, there is no definitive study proving drinking the tea can be fatal. On the other hand, there are no studies that prove kombucha has any health benefits at all. Much of the concern in the medical community about kombucha tea comes from the lack of regulation of the production process and ingredient list. 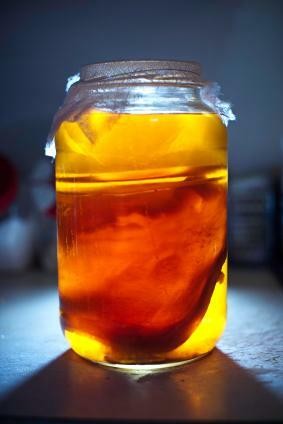 Kombucha tea can home-brewed, and it can be brewed in a long list of unregulated manufacturing facilities and labs. Each batch of tea can contain different ingredients, depending on the content of the kombucha "mushroom" colony and how long the product ferments. Further, since the brewing is unsupervised, there is no guarantee the manufacturing facility was sanitary. Dangerous germs could be introduced to the tea in dirty labs or manufacturing plants. Because the tea is so acidic, it should never be brewed in containers that are painted or include lead, but it has been. At least two lead poisoning cases have been linked to kombucha tea. Studies proving or disproving the safety of kombucha tea simply do not exist, so without evidence, the American Cancer Society recommends exercising caution when drinking kombucha tea and never using the tea as a substitute for traditional medical care.